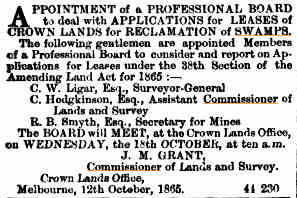 In the early days of settlement in Victoria, there were large pockets of land that were swamplands. They could not be used for grazing, except in the summer time. In the winter, with the rain, there was a boggy wet mass of land. The Government of Victoria, set up a Swamp Commission to look into the reclamation of these areas. This is part of that time and in particular, the story of the Carrum Carrum Swamp. There was a pocket of water that extended from an area around the Mordialloc Creek all the way down to Frankston and extended as far east as Dandenong. For people to get to Frankston they had to travel around this big wet area, which added considerable time to their journey. I will be discussing the Carrum Carrum Swamp further in my next blog.